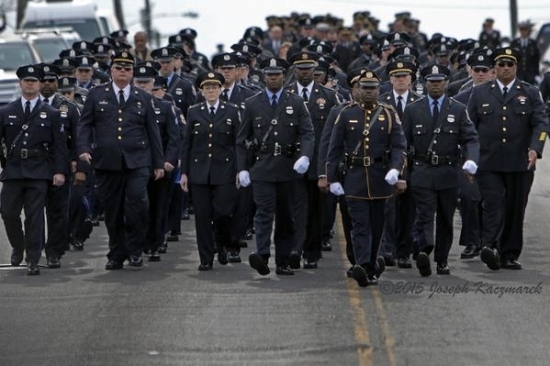 Hundreds of fellow police officers from across the Philadelphia region and the country gathered at the Francis Funeral Home in West Philadelphia this afternoon for the viewing of fallen Philadelphia Police Officer Robert Wilson III. 30-year-old Wilson was shot and killed in the line of duty during a robbery last week in North Philadelphia and has been hailed as a hero for his efforts to thwart the crime and protect the public. He leaves behind a 10-year-old and 1-year-old son. He was doing a security check and purchasing a game for his son at the GameStop store at 22nd and Lehigh when the store was targeted by two armed robbers. He died in the ensuing shootout.Today, in additions to the legions of officers and Officer Wilson's family top city officials including Mayor Michael Nutter and Commissioner Charles Ramsey were on hand. Philadelphia Eagles' Head Coach paid his respects as well and hand-delivered two special dedicated footballs to Wilson's sons. There will be a second viewing on Saturday morning from 7:00 a.m.-10:00 a.m. followed by a funeral service at the Palestra at the University of Pennsylvania, 235 S 33rd St, Philadelphia, PA 19104. -You can't pay cash on delivery, the transaction must be completed on the retailer's premises (so credit card over the phone/website). -The delivery driver has to be 21 and you have to be 21 and they have to check you. -You can only order 192 ounces or two six-packs per order. -You do NOT have to order food, but why wouldn't order some more cheese fries with your beer. -You have to place the order before 2 a.m. but they can deliver it anytime after. 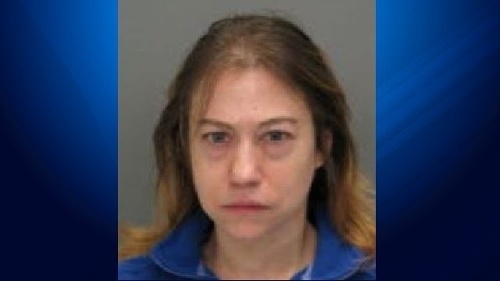 Upper Merion Police are asking the public's help in finding a woman missing since last month. Heather Tillette was last seen walking out of Einstein Medical Center on the 500 block of Germantown Pike in East Norriton around 8:40 p.m. on Thursday, February 26th. She is 5 feet 2 inches tall, 130 pounds, with shoulder length blond hair and blue eyes. She was wearing a blue or green fluffy knit hat, a red jacket, a pink/gray fleece shirt and carrying a white purse. Greater Philadelphia Search and Rescue is organizing a search party near the hospital for Sunday afternoon. Anyone with information is urged to contact Upper Merion Township Police Detective Elbert Lee at 610-205-8558.